…Deer Antler! I was so excited, I forgot to take a picture in situ. I picked it up, brushed snow away, and examined it. A real beauty. It will take up a space about 10 X 11 inches on the shelf. A tape along the curve of the main beam measures 18 inches. When the antlers start growing in the spring, they are made of cartiledge, blood vessels and nerve tissue and covered with fuzzy skin called velvet. According to one source I read, bucks in velvet are sensitive and protective of their antlers. In the fall, the soft tissue is converted to hard bone as minerals are deposited in the cartiledge matrix. Antlers can grow very fast – as much as an inch a day. To provide the developing antler with enough minerals, the body sometimes robs the skeletal system creating a condition known as physiological or temporary osteoporosis. Most of the minerals come from the ribs and shoulder blades which can lose as much as 40% of their calcium content. Through diet, the minerals are generally replaced by September. Older bucks lose their antlers from December through February. Younger bucks may hang on to theirs until March or April. Over the years I have marveled at the fact that I had never found antlers in the woods. You would think that with the amount of time I spend out there and with the size of our local deer population, I would find them all over the place… But this was my first. And I’m so excited! This entry was posted in mammals, nature. Bookmark the permalink. Yippee! That’s a fabulous find! Congratulations for breaking the ice! I also enjoy it when I find an antler. Usually I find them in late winter, but last year when hunting in the fall. my son and I found several too. Part of the reason they are hard to find is they are prized by small rodents for the calcium. There are places they are more likely to be found (wintering quarters are sometimes different for deer). Some people go looking for them every spring. I’ve never found an antler, but I did find a lower jaw bone a few days ago. I don’t think that would look so nice over my fireplace though – if I even had a fireplace, that is. I didn’t know that about the temporary osteoporosis, that’s quite something. I’m glad us humans don’t have to go through that! Great find! A friend told me I would many miles before I found a moose antler. I did. 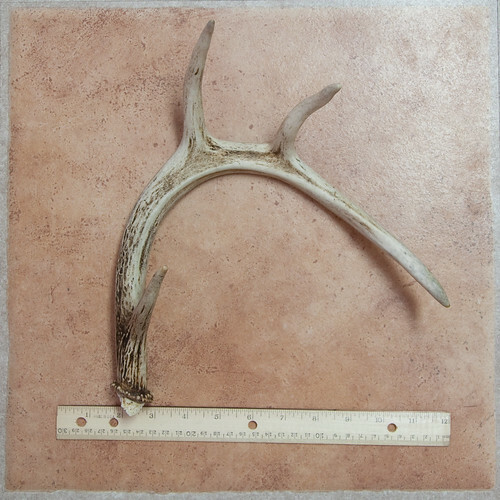 I always dreamed of finding a deer antler and after I found my first one, it seemed like they were everywhere. Now I have over 75. Enjoy the hunt, it will lead to some great times outside. PS-Rec’d my book, Winter Fungi, in the mail and just love it! Well done! I have always hoped to find one but so far nothing. Great find.